No, I didn’t break my leg while cycling. Instead, my accident occurred in the most dangerous place on earth: my own home. Statistics indicate that slip and fall injuries such as mine will most likely occur in your humble abode. In fact, statistically speaking, you are actually much safer out on the road – whether on a bicycle, on foot, in a car, or on a motorcycle. 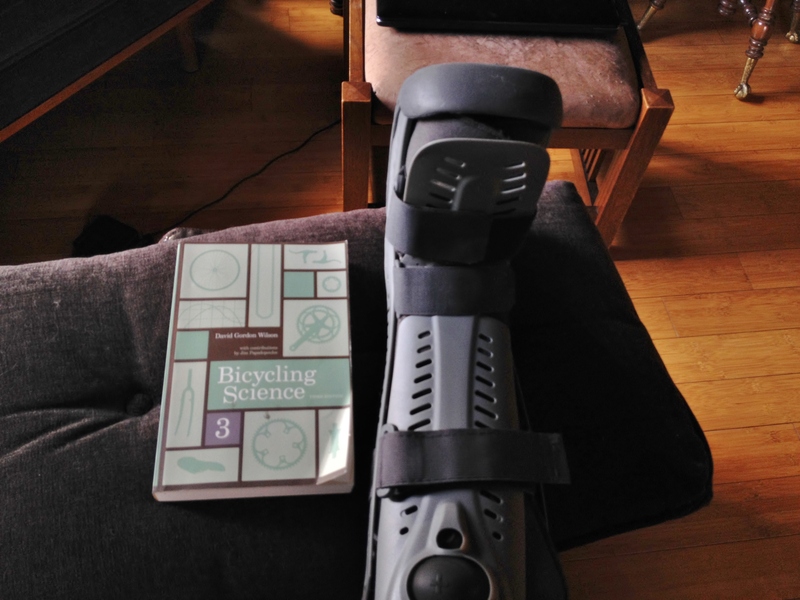 To recover from a broken bone in the lower leg, generally there are two phases: non weight bearing while in a cast or air boot, and weight bearing while in a walking boot. The former is the most challenging phase of recovery, as the bone can only heal properly if it is not subjected to movement. That means one’s mobility becomes seriously impaired. In times past, crutches were the only mobility aid out there. Anyone who has used crutches knows just how difficult and exhausting they can be, and can subject you to further injury if you are unable to master them in zen-like upper body strength fashion. Fortunately, bicycle technology blended with medical know-how has come to the rescue. Here is a “knee scooter” – an ingenious little 4 wheeled contraption which incorporates many cycling related components. There are cable brakes, an aluminum frame, a 90 degree head tube, flat bars, brake levers with lock out, bottle and basket holders, and a folding steerer. 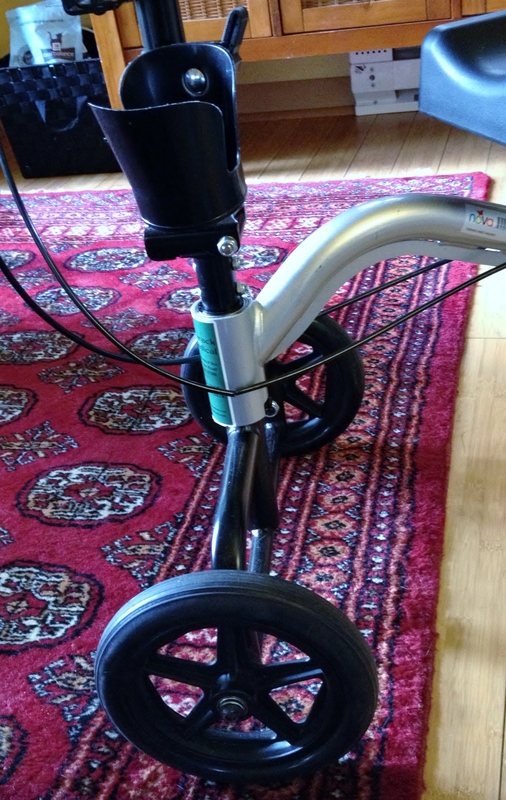 This particular model was made by NOVA – a long time manufacturer of various medical mobility devices. There are lots of other competitors out there, but this is what was available for rent from my nearest medical equipment retailer. The only significant complaint I have about the device is that the steerer doesn’t handle bumps very well, so will turn in full radius when it encounters even a small surface anomaly. Of course, this has nothing to do with the quality of the machine itself, but with the geometry of its design. A 90 degree head tube was probably deemed necessary to provide maximum stability when standing at rest over the scooter. If the wheels were given a caster angle, that would cause the wheels to have “trail”. As designed, its wheels have no trail. Trail provides for a kind of “self steering” which you don’t really even notice as you ride your bike – you find that your bike tends to right itself even if you give it the wrong inputs. Trail is a critical feature in motorcycle, automobile and bicycle design – without it our machines would be unstable as they attempt to navigate curves and surface anomalies. Low trail bicycles are great for front end loads, since they also have less wheel flop, but all bicycles must have trail in order to be rideable. While recovering, I took time to bone up (I can’t help the puns…) on front end geometry. While Bicycling Science, by David Gordon Wilson, is an excellent resource, I admit that I haven’t spent much time absorbing the physics and mechanics presented in his well written tome. But now, I took the time to review his chapter on bicycle handling. As it turns out, there’s a reason why no one can agree on what makes a bicycle handle well: since a bicycle can only balance on two wheels with a rider aboard, studying its dynamics are nearly impossible. Consequently, theories of bicycle motion and self-stability have not been validated experimentally. However, stable machines such as trikes and 4-wheelers can easily be studied, and one thing everyone knows is that a caster angle on the wheels is necessary for the vehicle to naturally right itself under movement. So why isn’t this nifty little device designed with a bit of caster angle? That would produce some trail, which would help to keep the little scooter stable as it goes over bumps. 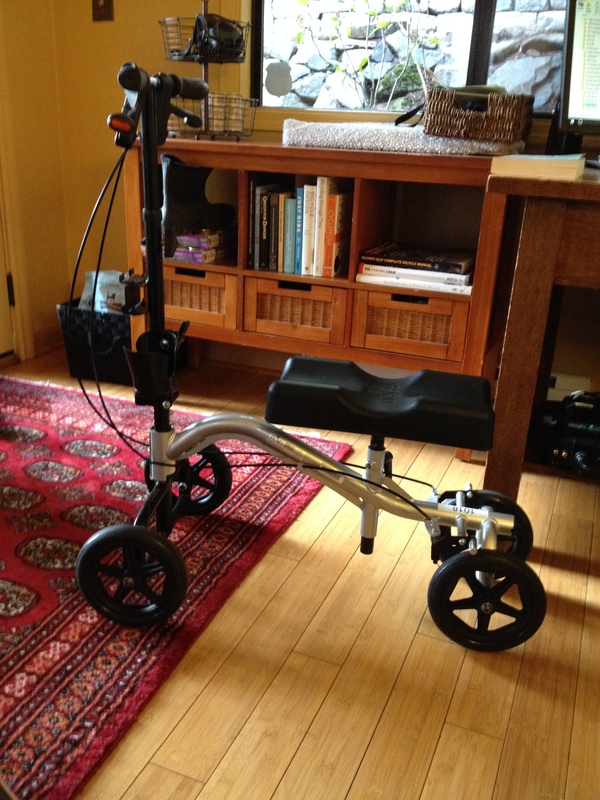 After researching the current knee scooter models available, I have found that there are some higher end models which incorporate a caster angle on the wheels, but such models are not typically available for rent, but can be purchased for a hefty price. If your injury is quite serious and requires a long recovery, I think it might be well worth it to purchase a higher end model which incorporates a caster angle. This would allow greater safety and mobility, especially in outdoor situations. Meanwhile, I’m working on keeping my little scooter maintained. The brake cables were poorly adjusted, and the bottle holder clamp needs a washer. 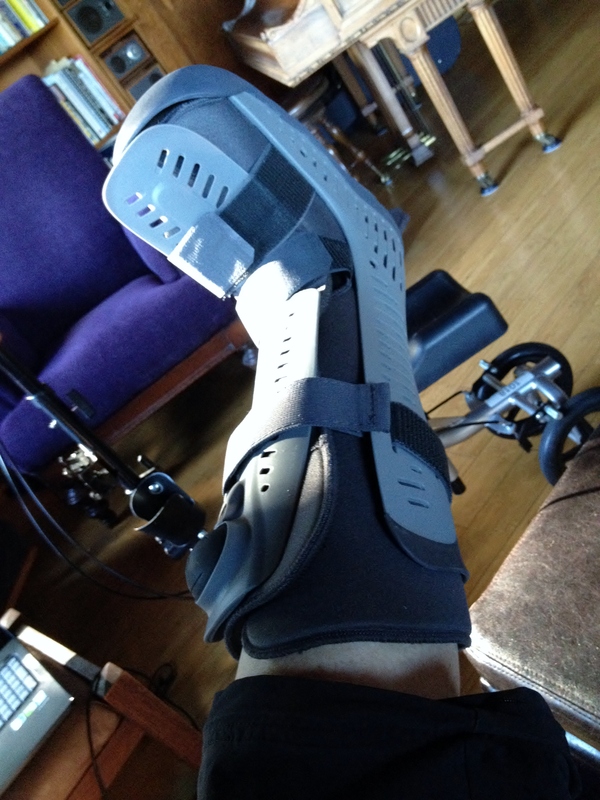 I’m sure I’ll find a few other mechanical shortcomings during my recovery. 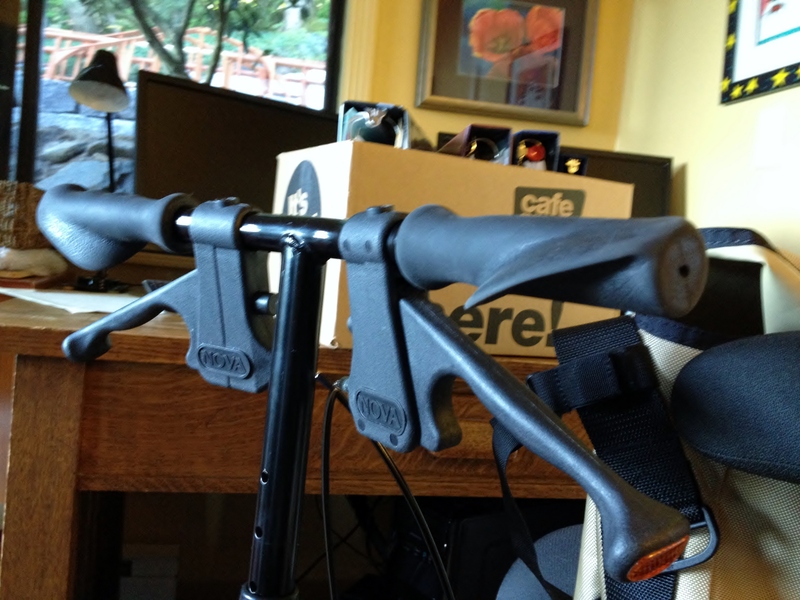 Even so, these knee scooters provide a clear advantage over crutches in terms of safety and comfort. 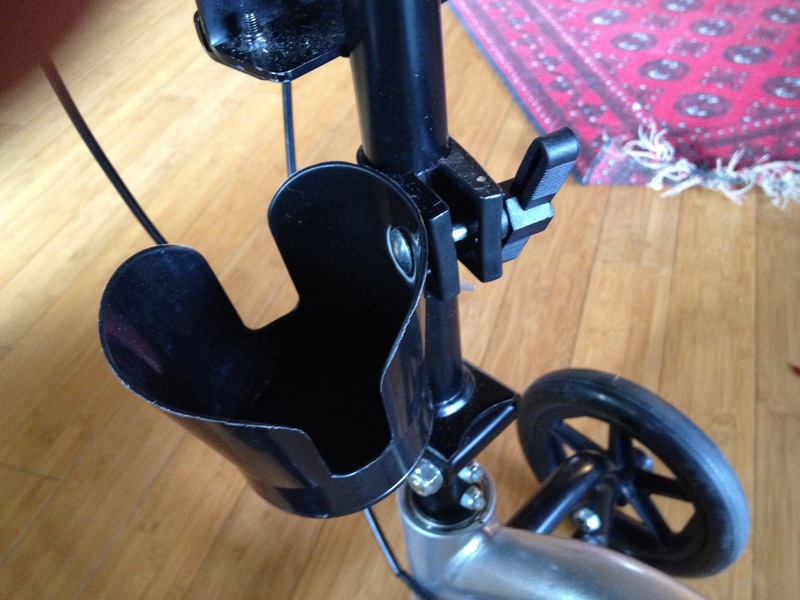 This entry was posted in cycling and tagged bicycle handling, bicycle trail, caster angle, knee scooter by Nola Wilken. Bookmark the permalink. Nola – I hope the bicycle restorer will be restored speedily!